If you haven’t picked up on it already, I have a very strong addiction, namely, wildlife photography. I’ve been afflicted with this compulsion for going on 30 years and it doesn’t seem to be subsiding. This week I had one of those rare moments that every wildlife photographer (and lover) cherishes. My addiction has cost me tens of thousands of dollars in travel costs to places like the Galapagos, the Amazon and the crown jewel Africa. You pay the big bucks for these places because the wildlife is abundant and more importantly, willing to let a photographer get close enough to get some great shots. Well this week I got one of those same moments right in the summit neighborhood. See that little dot. That’s an eagle. A couple of days ago we loaded the kayaks into the pickup and headed down for our second paddle out on Van Norden Lake. That in itself is pretty special in March. As we started paddling east out into the lake from the spillway we spotted a couple of raptors skimming over the lake. At first I thought it was a couple of early Ospreys out fishing. As we got closer and got the binocs on them we were thrilled to see it was a pair of Bald Eagles, an adult and a juvenile. 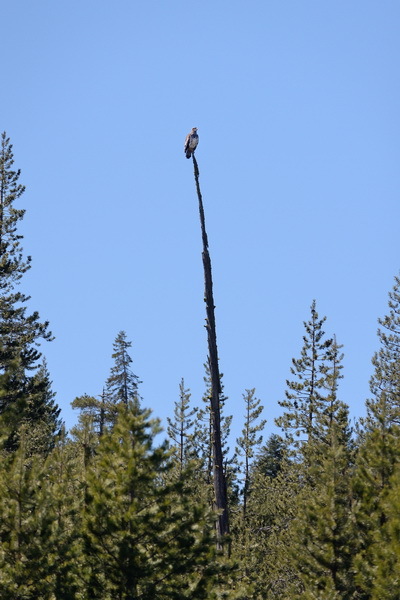 As we paddled out they flew up into a couple of tall pines to rest after their fishing. I got a couple of those “see that dot in the tree, that’s an eagle” shots which is what I usually get. We continued out to the north end of the back bay area of the lake to check on whether the Western Toads had started their annual mating season in the shallow waters of that area of the lake. To our surprise, they had. We saw many toad heads bobbing on the surface and lots of courtship action, but that’s another story. As we were watching the toads all of a sudden this huge shape dove out of the air above us and scooped up a young fish about 30 yards from us. 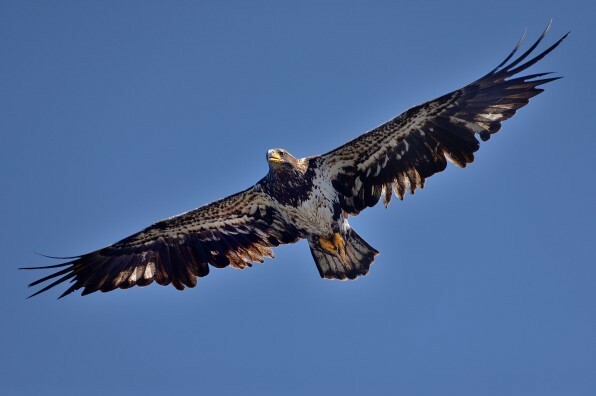 It was the juvenile Eagle. 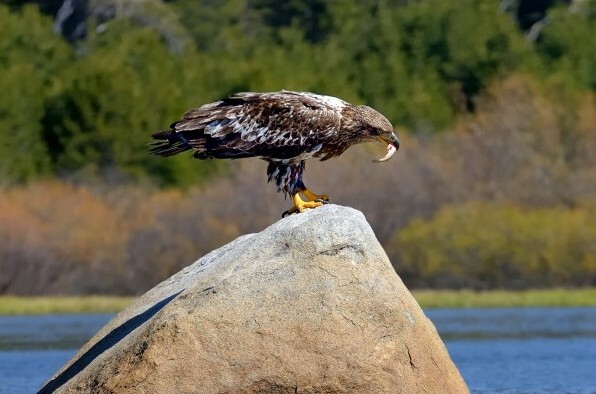 It proceeded to land on a rock about 10 yards from us and eat its catch. It seemed to be completely oblivious to us despite our close proximity. Needless to say, I was happily snapping away as it calmly devoured its meal and then sunned itself on the rock. It stayed on that rock for about ten minutes preening itself. I felt like the nature paparazzi. Some people wonder why we live at the summit where life is pretty remote and the weather can be extreme. It is moments like this one that make any minor inconvenience like a blizzard worth it. It’s also another reason why Lake Van Norden is so important to the summit area.